Hi, this is Mindy and I wanted a chance to finally prove myself in the boxing ring. A long time ago I was knocked out by a small girl named Kasey (see "Gloved Grapplers") and also in a match against Tara (see "Glass Jaw"). Both of these defeats were really humiliating … especially the one against Kasey. I had her beat! But I recently read her description of the fight and it really made me mad! She said something that I've never gotten over … "I remember how I started out feeling strong in my tight leotard but when Mindy started pummeling me with her gloves I started feeling exposed in that little outfit. Now it was HER turn to feel that way! Her long pale thighs jiggled as I punched her vulnerable body and face! She no longer looked strong in that black leotard." PALE THIGHS???? JIGGLED??? How dare she!! 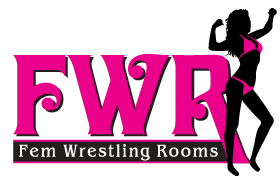 Well, when I recently visited FWR I specifically asked for a rematch with that little punk but they said she wasn't available. I was really disappointed but still wanted to prove myself so they suggested that I box some young coed named Becca. I took a look at her photo on her profile page and wasn't impressed. So the time came and I felt great! I've bulked up a bit since my match with Kasey and my hair has finally grown long and silky blond. I wore the same outfit, black leotard, boots, and gloves because they make me feel strong. The little blondie college girl showed up and looked like someone I would LOVE to knock out! Perfect shape, tanned, and the face that drives men nuts. I couldn't wait to pummel her!! We took our corners and awaited the bell. Sizing her up, I could imagine those cute legs of hers going limp as I deliver the final uppercut that would send her to the mat. I would PROVE who had the stronger look. The bell finally rang and we circled, gloves up and looking for an opening. The girl pulled back her fist to throw a punch and I easily ducked it and popped her in the face! The punch caught her off guard and she immediately dropped her gloves, leaving her pretty face open for more punches. It was cute how she kinda squeeked everytime my glove hit her! a few short jabs had her on the ropes where I connected with some belly punches. I wasn’t throwing extremely hard punches because I wanted to have some fun with her. It was obvious that I out matched her in every way. One of my belly punches cause her to bend over and expose her chin so I slammed an uppercut into it that snapped her head back! Her eyes were a little glassy after my uppercut so I decided to have some fun with her. No one said anything about this being a strict boxing match so, like the match I had against Kasey, I threw in a quick wrestling move and flipped the cutie to the mat! It was awesome to be in control! As the little blond squirmed on the mat I thought back to the match I had with Kasey and what she had said in her description. It was true … being in control made me feel strong in my tight leotard! I imagined that my opponent didn't feel the same. Her face probably stung from my punches and her tanned legs were already going weak. I kneeled down above her head and plowed a few punches into her cheeks, snapping her head back and forth. Then I pulled her up to a sitting position and hooked her head in a dragon sleeper style lock while I punished her exposed belly. The little "Ooouuuff!" that came out of her with each punch was really satisfying! When I let her go she dropped back down to the mat looking defeated. I wondered what she was thinking, laying there in her cute red leotard. Was she feeling defeated yet? Was she humiliated by my obvious dominance of this boxing match? She began to moan so I decided to get her back to her feet … but not until I smashed a double fisted bomb into that cute tummy! Ha ha, the hit caused her body to jack knife and when her legs fell back to the mat, the thighs jiggled a little. I thought back to what Kasey said about me! I was getting even, even though it wasn't Kasey that I was destroying! I finally pulled the girl up to her feet and placed her in a corner. Her legs were so weak that she had to hang on the ropes just to support herself! I probably could have finished her off at this point but I was having too much fun! I was obviously the stronger fighter, the taller fighter, the bigger fighter, and the best looking fighter in this ring! I threw punches into her belly and face, but didn't put all my strength into them. I wanted to humiliate her a little more. My punches kept her weak as she hung on those ropes grunting and groaning! It would have been so cool if she would have just said, in a weak voice, "just knock me out … finish me, I'm done …"
But I'm realistic. She might say something like that if I beat her down some more but she wasn't ready yet …. and neither was I! I grabbed the young coed by the arm and threw her to the opposite corner so I could give her a shattering body splash!